In this lesson, we will learn how to solve problems involving the equilibrium of a body on a rough horizontal plane. 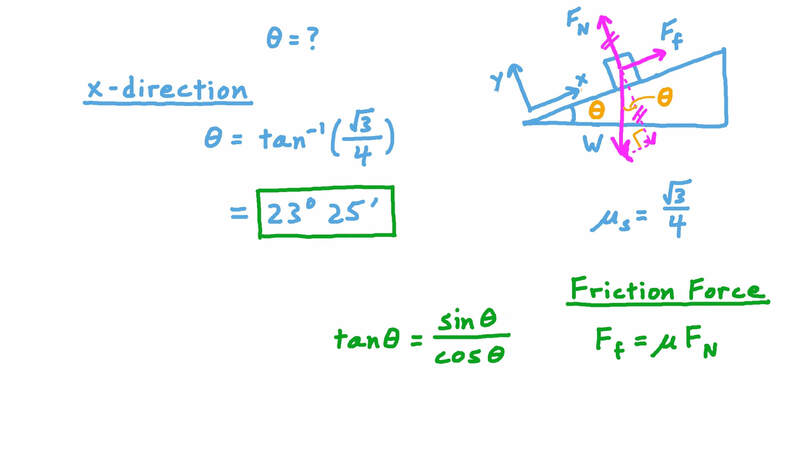 Given that the coefficient of static friction between a body and a plane is √ 3 4 , what is the angle of friction? Round your answer to the nearest minute if necessary. A body weighing 30 N rests on a rough horizontal plane. Two horizontal forces 𝐹 1 and 𝐹 2 are acting on the body such that 𝐹 1 makes an angle of 1 2 0 ∘ with 𝐹 2 . Given that 𝐹 = 1 7 1 N and the angle of friction of the surface 𝜆 = 3 0 ∘ , find, to two decimal places, the minimum value of 𝐹 2 required to make the body move and the angle 𝜃 between the direction of motion and 𝐹 1 as the body starts to move to the nearest degree. A body weighing 25.5 N rests on a rough horizontal plane. A horizontal force acts on the body causing it to be on the point of moving. Given that the coefficient of friction between the body and the plane is 3 1 7 , determine magnitude of the force. A body weighing 8.5 newtons rests on a rough horizontal plane. A horizontal force is acting on it causing it to be on the point of moving. Given that the force of the friction was 3.4 newtons, find the coefficient of static friction. A body is resting on a rough horizontal plane. The coefficient of friction between the body and the plane is 0.2 and the limiting friction force that is acting on the body is 80 N. Given that 𝑅 is the resultant of the force of friction and the normal reaction force, find the magnitude of 𝑅 . A body weighing 8 N rests on a rough horizontal plane such that the coefficient of static friction between the body and the plane is 1 4 . A force, whose line of action makes an angle of 𝜃 to the horizontal where c o s 𝜃 = 5 1 3 , is acting on the body causing it to be on the point of moving. Given that 𝑅 is the resultant of the force of friction and the normal reaction force, find the magnitude of 𝑅 and the angle 𝜃 it makes to the vertical stating your answer to the nearest minute. A body weighing 78 N rests on a rough horizontal plane where the angle of friction between the body and the plane is 3 0 ∘ . A force is acting on the body such that its line of action makes an angle of 3 0 ∘ to the horizontal. Given that, as a result, the body is on the point of moving, find the magnitude of this force. A body weighing 8 N rests on a rough horizontal plane. A force of 6 √ 2 N is acting on the body such that its line of action makes an angle of 4 5 ∘ downward to the horizontal. Given that, as a result, the body is on the point of moving, find the coefficient of friction 𝜇 between the body and the plane and the angle of friction stating your answer to the nearest minute. A body weighing 9 6 √ 2 N rests on a rough horizontal plane. If a force of 32 N acted on the body such that its line of action made an angle of 4 5 ∘ upwards with the horizontal, it would cause the body to be on the point of moving. Instead, a force of 𝐹 N was acting on the body in the opposite direction. Find the minimum required value of 𝐹 to cause the body to move. A body weighing 5 N rests on a rough horizontal plane. The coefficient of friction between the body and the plane is 3 4 . Given that 𝐹 is the magnitude of the friction force measured in newtons, express the range of its possible values as an interval. A body weighing 20 N rests on a rough horizontal surface such that the coefficient of friction between the body and the surface is √ 3 2 . A horizontal force is acting on the body. Given that 𝑅 is resultant of the force of friction and the normal reaction force, express the possible range of its magnitude as an interval. A body weighing 19 N rests on a rough horizontal plane. When a force of magnitude 9 √ 2 N acted on the body such that its line of action made an upward angle of 𝜃 to the horizontal, the body was on the point of moving. When a different force of magnitude 1 7 1 √ 2 N acted on the body in the opposite direction, the body was also on the point of moving. Find the coefficient of friction between the body and the plane. A body weighing 63 newtons rests on a rough horizontal plane. The tangent of the angle of static friction between the body and the plane is 1 8 . The body is attached to a light inextensible string which is inclined to the horizontal by an angle whose sine is 1 2 1 5 . Given that the tension in the rope causes the body to be on the point of moving, find the magnitude of the tension 𝑇 and the magnitude of the static friction 𝐹 . A body of weight 17 N rest on a rough horizontal plane. Two horizontal forces of 12 N and 8 N are acting on the body such that the angle between their lines of action is 1 2 0 ∘ . Given that, as a result, the body is on the point of moving, find the measure of the angle of friction between the body and the plane stating your answer to the nearest minute. A body weighing 47 N rests on a rough horizontal plane. Two horizontal forces of 1 N and 4 N act on the body causing it to be on the point of moving. Given that the angle between the lines of action of the two forces is 6 0 ∘ , find the coefficient of static friction between the body and the plane. A body weighing 42 kg-wt rests on a rough horizontal plane such that the coefficient of static friction between the body and the plane is √ 3 2 . A horizontal force acts on the body, causing it to be on the point of moving. Given that 𝑅 is the resultant of the force of friction and the normal reaction force, find the magnitude of 𝑅 and the angle 𝜃 that the resultant makes with the vertical to the nearest minute. A body of weight 11 N rests on a rough horizontal plane. A horizontal force of 10 N is acting on a body causing it to be on the point of moving. Another weight of 44 N is placed on top of the body. Find the minimum horizontal force required to make the body and the weight move together. A body of weight 45 N rests on a rough horizontal plane. If a horizontal force of 11 N acted on the body, it would be on the point of moving. Instead, a force, whose line of action was inclined to the horizontal at an angle of 6 0 ∘ , was acting on the body. Given that the body was on the point of moving, find the magnitude of this force rounding your answer to two decimal places if required. A body weighing 40 kg-wt rests on a rough horizontal plane. It is being pulled by a string which makes an angle of 3 0 ∘ to the horizontal. Given that the coefficient of friction is 0.8, determine the minimum tension in the string that will cause the body to move. Round your answer to the nearest two decimal places. A box weighing 𝑤 kg-wt rests on a rough horizontal plane. The coefficient of static friction between the box and the plane is 1 3 . Two horizontal strings, which make an angle of 9 0 ∘ to one another, are pulling on the box. The tension in each string is 40 kg-wt and 42 kg-wt, respectively. Given that the box is on the point of moving, find its weight 𝑤 . A body weighing 90 kg-wt rests on a rough horizontal plane. A horizontal force of 45 kg-wt is acting on the body. Given that the coefficient of friction between the body and the plane is 2 3 , determine the ratio between the current force of friction and its maximum possible value. A body weighing 99 kg-wt rests on a rough horizontal plane such that the coefficient of static friction between the body and the plane is 2 √ 3 1 1 . A horizontal force of 30 kg-wt is acting upon the body. Which of the following statements is true about the force of friction 𝐹 in this system? A body weighting 68 kg-wt rests on a rough horizontal plane. When a horizontal force of 59.5 kg-wt acts on it, it is on the point of moving. Determine the coefficient of friction between the body and the plane. A body of weight 79 N rests on a rough horizontal table. It is attached by a light inextensible string passing over a smooth pulley fixed at the edge of the table to a weight of 41 N hanging freely vertically below the pulley. Under these conditions the system is on the point of moving. The body is then attached by a second inextensible string passing over a second pulley fixed at the opposite end of the table to a second weight of 𝑊 N hanging freely vertically below the pulley. Determine the weight 𝑊 which will cause the body to be on the point of moving. A wooden block weighing 37 kg-wt rests on a rough horizontal table. It is attached by a light inextensible string passing over a smooth pulley fixed at the edge of the table to a weight of 14 kg-wt hanging freely vertically below the pulley. Given that the system is in equilibrium, determine the normal reaction force 𝑅 and the friction 𝐹 .